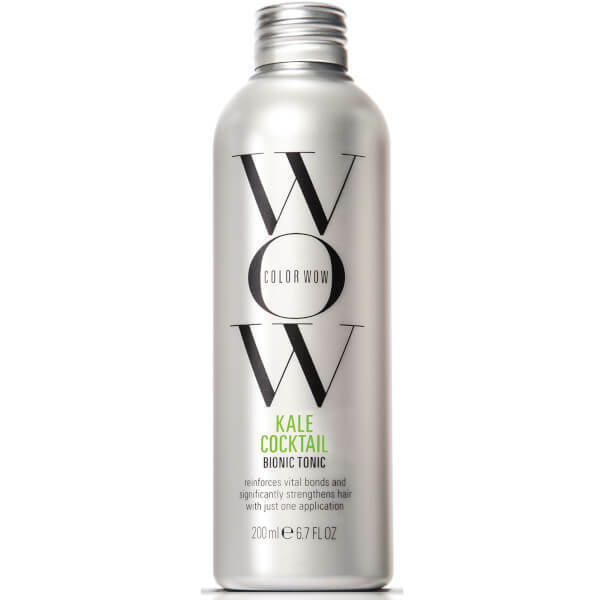 Improve hair's strength and condition with Color WOW's Kale Cocktail Bionic Tonic, a leave-in treatment that works to reinforce hair's internal bonds by over 50% in just one use. When hair is colour-treated, the natural, internal cysteine bonds that keep strands strong and resilient are broken down, resulting in weakened, vulnerable hair. 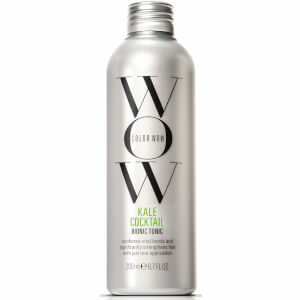 To help combat this, a cocktail of sulphur-rich Sea Kale, protein-building Amino Acids and B Vitamins work to help reinforce internal bonds and significantly reduce breakage after just one application; hair is left smooth, detangled and strengthened. Helping to boost hair's strength and resilience, the protective formula also shields from UV damage to keep hair and colour safeguarded. Apply to lightly towel-dried, damp hair. Pour a coin-size amount of product into palm, rub palms together then smooth throughout hair. Do not rinse, style as usual. May be used along with either Coconut or Carb Cocktail. RESULTS ARE ACCELERATED AND ENHANCED WHEN HEAT FROM BLOW-DRYERS AND/OR STYLING APPLIANCES IS APPLIED. Water (Aqua), Behentrimonium methosulfate, Cetyl alcohol, Caprylic/Capric Triglyceride, Polyquaternium-37, Glycerin, Butylene Glycol, Phenoxyethanol, Propylene Glycol Dicaprylate/Dicaprate, Silicone Quaternium-18, Caprylyl Glycol, Ceteareth-20, PPG-26-Buteth-26, PEG-40 Hydrogenated Castor Oil, Fragrance (Parfum), Trideceth-6, PPG-1 Trideceth-6, Trideceth-12, Crambe Maritima Leaf (KALE) Extract, Ascophyllum Nodosum Extract, Benzyl Salicylate, Benzyl Benzoate, ButylphenylMethylpropional, Hydroxycitronellal, Linalool, Limonene.